Summer is on its way which means the thermometer is about to get cranked up. While this is good news for us because it means more BBQs, backyard cricket, time at the beach and afternoon drinks, your concrete driveway may not be looking forward to it. Concrete is one of the hardiest and most durable materials on earth. However, it isn’t entirely impervious to the pressures of time, wear and tear and weather. So, to ensure your driveway makes it through the toughest time of the year, follow these preparation tips. A clean driveway will handle the heat far better than a dirty one. On top of that, if your driveway is dirty, the stains will be baked on by the heat, and it may be impossible to remove them. So, head out to your driveway this weekend and sweep away all the leaves, sticks, dirt and debris before giving it a good clean with a pressure washer. If you don’t have a pressure cleaner, head to your nearest hardware hire store and rent one. You need to seal your driveway every couple of years or so, and sealing your driveway is especially important before summer hits. Heat can create cracks and fissures in your concrete, and the best way to protect against this is to seal it with a high-quality product. A sealer will also keep your driveway looking brand new for as long as possible. Contact your local concreter for advice on the type of sealer you should use. You also need to plan your seal according to the weather. Ideally, you will seal it during a period of 3-4 sunny days with no rain. Concrete is surprisingly easy to repair, and you should attend to any cracks or potholes before the heat turns up. Cracks and holes allow for the infiltration of water, which ruins your driveway, and it also allows weeds to push through, which increases your maintenance. 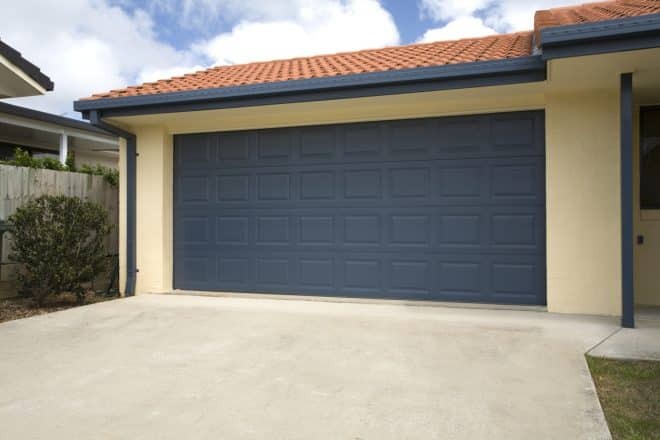 You can read our Ultimate Guide to Concrete Driveway Repairs for all the information you need on maintaining your concrete driveway. Yes, concrete is sturdy, but you still have to be careful not to damage it. You need to be especially cautious with sharp objects, such as shovels and edge-cutters. The slightest chip in your driveway can spread, so use plastic-headed shovels whenever you’re working near your driveway. A great way to protect your driveway during summer is to do a bit of landscaping. For example, you can line your driveway with tall, thick-foliaged trees to provide shade in future seasons. You can also contract an experienced landscaper to install mature trees so your driveway can even enjoy the benefits of shade for the upcoming summer. Darker colours, like blues and blacks, attract and lock-in heat. We all know it what it feels like to be wearing a black top on a 30+ degree day. If you notice that your driveway gets extremely hot during the summer, you should consider painting it a lighter colour. Painting your concrete a lighter will not only reflect heat, it will also give your home an exciting new look. If your family has numerous cars, chances are not all of them can fit in the driveway or carport. That leaves some cars sitting outside, exposed to the harsh rays of the sun. Excessive sun exposure will damage the paint on your car, and by installing a shade sail, you will protect your vehicle and your driveway. So, follow these tips, and our driveway will enjoy the upcoming summer as much as you do. If you look after your concrete driveway, it will give you years of enjoyment, and your initial investment will be a worthy one.